Upon arrival in Haiti, I was struck by the nonchalance of the first baggage handlers, street vendors, and cops that I saw. Despite a harrowing natural disaster that befell the dirt-poor Caribbean country just four months ago, the humdrum of daily life here goes on. I was expecting a nation still in shock, mourning the lives of several hundred thousand deceased countrymen. But, by day and by night, Haitians appear to have resumed business and pleasure as usual. Hawkers vend their vitamins, electronics, and paintings with full gusto. Partygoers jive to the latest kompa rhythm, And roosters cluck in every quarter of the capital as before the quake, ushering in each chaotic new day. Despite surrendering to its destiny, the place famous for voodoo, Wyclef, and grinding poverty is still struggling for survival. While the dead are buried but far from forgotten, many thousands maimed in the quake gather at temporary camps where they have received medical treatment. And millions of Haitians who are highly vulnerable to the elements wait hopelessly for the next flash flood, hurricane, or earthquake to devastate their fragile living arrangements. As my colleague and I filmed at the American Refugee Committee-administered Camp Hope, just minutes from the Dominican border, we looked at people who were battered but buoyant. Aside from basic tasks like fetching water, many camp residents played domino or frolicked with friends. A few small groups were at work -- some setting up a perimeter fence to keep out goats and others selling goods at a makeshift market next to the cactus-lined thoroughfare through the camp. Although school is back in session for children at Camp Hope and elsewhere, we asked what kept most adults busy during the long, hot days of the rainy season. The answer was simple: "nothing." The bottom line was that these folks subsisted with Taiwanese Red Cross tents and rice rations from evangelical missionaries. Some of the tents there were designed for hiking trips and not as semi-permanent housing solutions for entire families. But certainly, we thought to ourselves, the situation could be much worse -- since the camp appeared to meet the most immediate needs of its 1300 residents. Aid groups have been saying for quite a while that they are transitioning from fulfillment of urgent humanitarian needs to more long-term issues, but they still supply the most basic food and housing provisions for millions of internally displaced persons. Yet, along with basic insecurities about food and shelter, chronic underemployment remains the long-term scourge for so many Haitians. One MINUSTAH commander that we met suggested that the country's development had been set back by at least ten years in the quake. While the peacekeepers were thought to be almost finished with their mission just before the quake hit, it is clear that their security presence will be necessary for many years to come. They continue to facilitate political stability and mitigate against countless worst-case scenarios. Among other catastrophic aspects of post-quake Haiti, roads in the capital city and beyond are in pitiable condition. And the country's astoundingly low level of economic development raises many questions about a realistic set of goals for the proud but badly bruised Haitian Republic. The viability of Haiti's government remains in doubt. In just one day, we observed three vehicle accidents where Haitian police -- the most publicly visible and potentially powerful representatives of the government -- were present but unwilling to assert their authority and properly manage the situation. I continue to wonder whether deterministic Haitians have a tendency to see themselves as too powerless to bother challenging their intertwined individual and national fates. 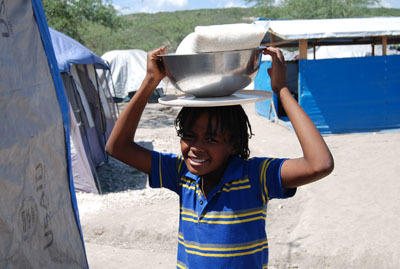 But alas, from Camp Hope to Port-au-Prince, Haitians gracefully battle for a better tomorrow. Ben Piven is a freelance multimedia journalist reporting from Haiti with his colleague Mohammad Al-Kassim.